I got a question from a reader last night who was looking at some code from one of my Xamarin seminars. Ryan asked about how to extract the content from a pdf file, draw on it, and email it in iOS. If you have a question feel free to contact me through my blog. I get lots of questions like this, but I do my best to respond to them all. Move the creation of the CBPeriheralManager into the constructor. Call the StartAdvertising method in ViewDidAppear. UPDATE: Xamarin.iOS now handles getting the folder path correctly when using Environment.SpecialFolder in iOS 8 as well. However, in iOS 8 the location of some folders, namely the Documents and Library folders, has changed such that they are no longer within the app’s bundle. Apple describes the changes in Technical Note TN2406. To use location in iOS you go through the CLLocationManager class. Before iOS 8 the first time an app attempted to start location services the user was presented with a dialog asking to turn location services on. You could set a purpose string directly on the location manager to tell the user why you need location in this dialog. In iOS 8 you now have to call either RequestWhenInUseAuthorization or RequestAlwaysAuthorization on the location manager. Additionally you need to add either the concisely named NSLocationWhenInUseUsageDescription or NSLocationAlwaysUsageDescription to your Info.plist. Thanks to my buddy James for tracking these down. Before iOS 8 you could set the InputAccessoryView on a UITextField from a view contained in another controller. While this worked before iOS 8, it did not guarantee the view controller hierarchy would be set up properly. A better approach, even before iOS 8, would be to set the InputAccessoryView directly to an instance of UIView subclass, not one contained in another UIViewController. Practically speaking, people would take the view controller approach because it let them set things up via a xib. Therefore, to handle the view controller case, iOS 8 introduced the InputAccessoryViewController property on UIResponder. It’s still easier to just use a UIView subclass imho, but if you need to use a UIViewController, set it to InputAccessoryViewController. Apple states in their documentation that you should not add a view to a UIActionSheet’s view hierarchy. Before iOS 8 adding subviews to a UIActionSheet would actually work, although it was never the intention (nor should it be subclassed). Code that took this approach should have presented a view controller. In iOS 8 subclassing UIActionSheet or adding subviews to it will no longer work. Additionally UIActionSheet itself has been deprecated. Instead, you should use a UIAlertController in iOS 8 (UIAlertController should also be used in iOS 8 in place of the deprecated UIAlertView) as I discussed in my iOS 8 webinar. Be sure to check out my colleague James’ Flashcast on Xamarin.Forms on August 27th. Here’s an F# iOS 8 Scene Kit port of the C# code from the Xamarin blog, ported with some help from Larry O’Brien. You can read more about Scene Kit on the Xamarin blog. 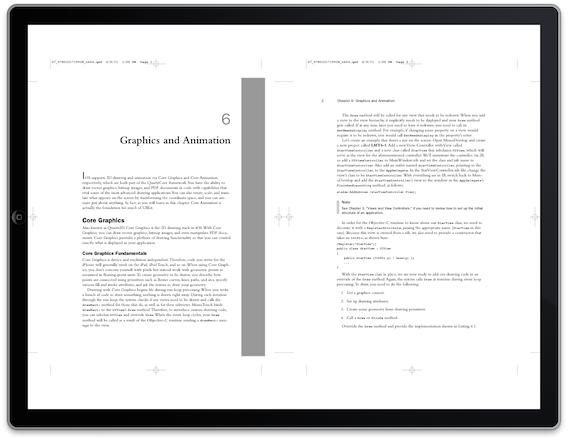 I just got a question from a Core Graphics presentation I gave a while back (from the first Xamarin Seminar) about how to use Core Graphics to render a PDF with 2 pages side-by-side in landscape. Since this question has come up a couple times in the past I figured I’d write a blog post about it. To do this for 2 pages, use the SaveState and RestoreState functions of the CGContext to get the transformation matrix back to its intial state, so that the transformation of the first page isn’t applied to the second page.